Protecting their art treasures from harmful daylight has always been a major concern for galleries and museums, which often resorted to simply blocking it out. Thankfully, the approach is a lot more subtle these days. In any gallery, museum or historic house with precious art, artefacts and other vulnerable exhibits, the most obvious and crude response to the problem of UV damage from daylight is simply to screen it out altogether. Which is effectively what institutions have done for decades. However, where galleries and museums are concerned, particularly in new buildings or new extensions, there has been a widespread change in attitude. With pragmatism (how much havoc can daylight wreak on a sculpture, for instance?) and careful control (building orientation, time of day and year are all factors that can be scripted into a strategy to mitigate damage), the trend has been to a less vampiric reaction to daylight. Arup has been an undoubted pioneer and expert in this area -- the Modern Wing of the Art Institute of Chicago and Harvard Art Museums (both Renzo Piano Workshop), the Hepworth Gallery (David Chipperfield Architects), the Acropolis Museum in Athens (Bernard Tschumi Architects), the Broad Museum (Diller Scofidio + Renfro) -- devising complex engineering solutions for daylight control. Sometimes, however, the project does not necessitate the engineering bells and whistles of elaborate control systems. The new scheme for the European Galleries at the V&A is a case in point, and even involved natural shading. The aim here was to literally open up the protective box in which the galleries had been kept for three decades. 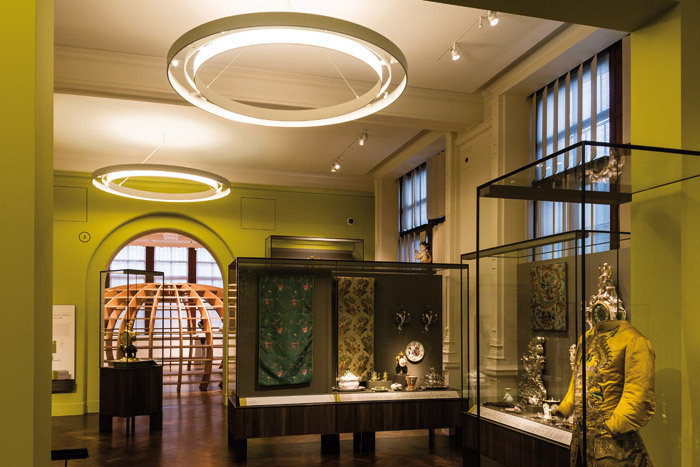 'The challenge of the whole project was that the V&A wanted to show off the original Aston Webb galleries and it wanted to establish a connection with the outside world,' says Mark Sutton-Vane of Sutton Vane Associates, responsible for the design of both daylighting and artificial lighting schemes. 'Some 30 years ago, when ideas around museum design were very different, the galleries had been entirely boxed in to cut out all of the daylight in order to create optimum environmental conditions to protect the exhibits. The galleries concerned occupy the entire run of galleries to the left as visitors enter the main door. The galleries on Cromwell Road face south and those on Exhibition Road face west, so the sunlight issues are significant. SVA worked with the architect to build a series of cardboard models that were tested in the artificial sky at The Bartlett, the architecture school at UCL. Various meshes, blinds and other devices were trialled to model exactly like the light coming in at any time. This was followed by extensive 3D computer-modelling of all the galleries with simulated daylight. 'These detailed everything about the environment around the galleries -- including the location of the plane trees that provided some barrier to sunlight on Cromwell Road and the other museums on Exhibition Road that gave some shade to the west elevation,' says Sutton-Vane. A slight disaster along the way was that the council decided that one of the trees outside had to be cut down. 'We had been relying on the trees to provide good leaf cover in the summer,' says Sutton-Vane. Gallery 4 has windows to both south and west. 'The design team and the museum wanted this one to be brighter to mark the transition as the visitor turns the corner,' he adds. 'So here, the blinds were designed to be less obstructive to the daylight.' The V&A wanted to avoid manual control. The historic room sets (of which there are three) are all shielded from any kind of natural light. One of the room sets appears to have a window, but the effect is created using LEDs. Another has the effect of candlelight, again conjured up by artificial sources; in this case tungsten lamps. 'We could not find LEDs that accurately mimic candles,' says Sutton-Vane. Daylight and artificial light are necessarily intertwined in the considerations for the scheme. 'Lighting design can be described by the level of contrast,' says Sutton-Vane. 'The greatest contrast has bright beams in a dark interior -- very dramatic and theatrical. The other way of doing it is low contrast, where everything is lit by low-level soft lighting with some artefacts picked out. With a large number of properties where daylight is the principal source of light for visitors to see the interiors and contents, the National Trust initiated a research programme in 2013 to better understand daylight performance. The programme seeks to bring together the latest in illuminance-capture techniques with climate-based simulation to refine and develop its systems of daylight management, typically the manipulation of shutters and blinds by both in-house staff and volunteers. John Mardaljevic, professor of Building Daylight Modelling at the School of Civil and Building Engineering, Loughborough University, and Dr Stephen Cannon-Brookes, principal of Cannon-Brookes Lighting and Design, have recently carried out a pioneering low-cost daylight study. The aim was to get a more precise measurement of daylight patterns, and their variability over a longer period. Clearly, this could be achieved by 3D CAD modelling, but the expense makes this impractical for bodies such as the National Trust, with historic houses in the hundreds. 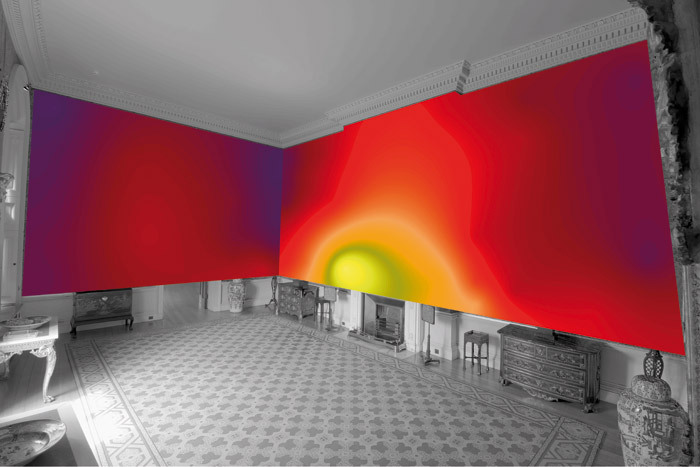 Given these practicalities, this study has pioneered the use of high dynamic range (HDR) imaging as a measurement tool to derive the daylight illumination field across wall surfaces in the Smoking Room at Ickworth House, Suffolk. The illumination field is something that previously could only have been determined using simulation or, at considerable expense and disruption, a large array of illuminance loggers -- at present impractical for the majority of spaces, except those of particular significance, such as the Great Hall at Hampton Court. The DSLR camera installed in the Smoking Room at Ickworth House is tethered to a 'headless' Mac Mini computer (no screen or keyboard). Every 10 minutes the computer initiates a controlled sequence of exposures taken with progressively longer shutter duration (with a fixed aperture). Following each capture sequence the computer 'compiles' an HDR image from the multiple exposures. Each pixel now contains a measure of scene luminance in cd/sq m. With wide-angle lenses, vignetting correction is applied to compensate for light fall-off away from the image centre. 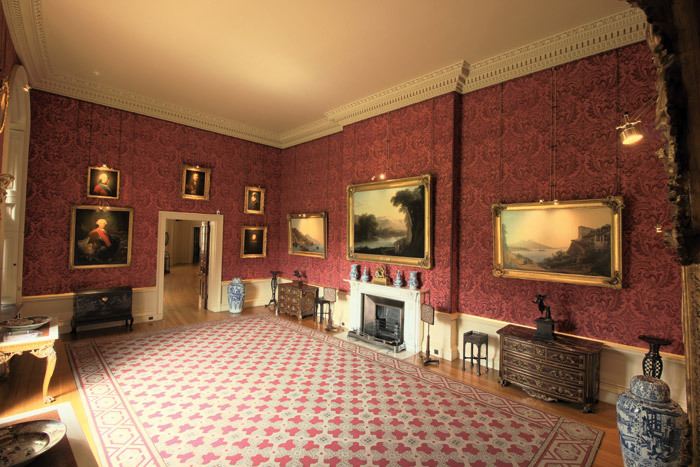 The photograph of the Smoking Room (shown) is one of the actual HDR image captures. Knowing the luminance and reflectance of a surface, it is then possible to calculate the amount of light falling on a particular surface. 'Compared to other environmental factors, such as temperature and relative humidity, acquisition of illuminance data for daylight in interiors is challenging as the variation across room surfaces can be substantial, and levels need to be monitored continuously over long periods,' say Mardaljevic and Cannon-Brooke.